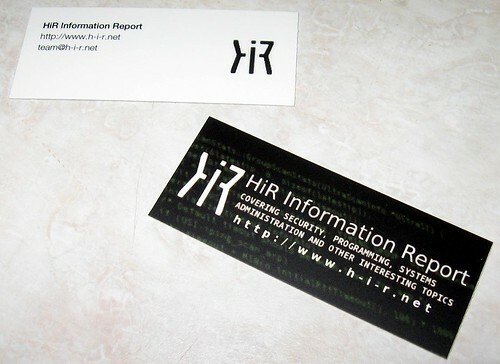 It's hard to tell, but there's green source code in the background of the front of the card. These are MiniCards by Moo.com. They've got a nice finish. I'll be handing them out to the HiR crew soon. We were all sick of being at conventions and events without being able to hand anyone some contact info. The e-mail address on the back will spam the whole team (so please don't abuse it?) Note: AsmodianX@, Frogman@, tmib@ and ax0n@ will get to individual writers at h-i-r.net. Also, the KC 2600 meeting is coming up in one week. Same time and place. Oak Park Mall food court at 5:00PM.